The Met Office has issued a severe weather warning for Peterborough as Storm Diana is set to blow through the city. The yellow weather warning for high winds is in force throughout today, Thursday November 29, up until 5pm. 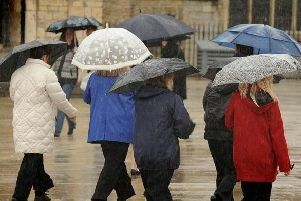 A Met Office spokesman said: "Windy and wet conditions will affect many areas today. "Some delays to road, rail, air and ferry transport are likely with some journeys taking longer. There is the chance of some cancellations as well as some road/bridge closures. "It’s likely that some coastal routes, sea fronts and coastal communities affected by spray and/or large waves with a small chance of injuries from large waves and beach material being thrown onto sea fronts, coastal roads and properties."